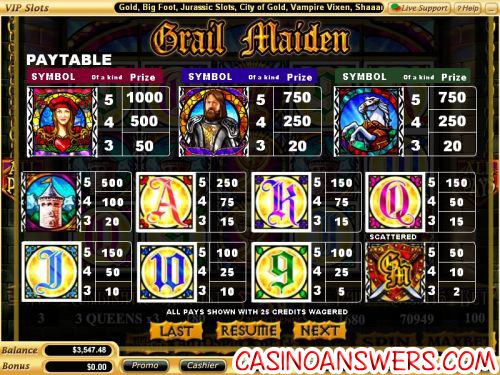 Grail Maiden Video Slot Guide & Review - Casino Answers! Grail Maiden is a 5-reel, 243-way video slot developed by Vegas Technology, featuring a wild symbol, expanding wilds and a free spins feature. You can play the Grail Maiden at USA-friendly casinos Go Casino and VIP Slots Casino. Coin values on the Grail Maiden slot machine are $0.01, $0.05, $0.25 and $1. It is not a payline slot and instead is an all pays video slot that pays 243-ways. 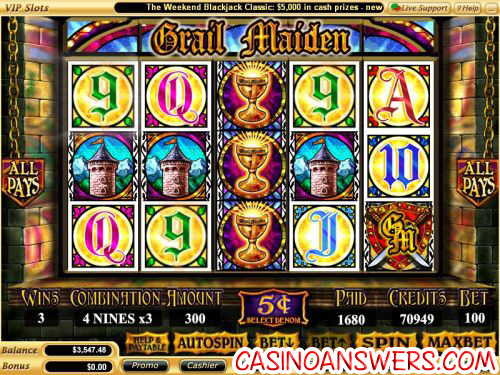 You can bet 25 coins, 50 coins, 75 coins or 100 coins per spin on the Grail Maiden slot game. Grail Maiden is a quarter slot. You can bet as little as 25 cents up to the highest total bet of $100 per spin. Unfortunately, Grail Maiden only lists the coin bets rather than listing bets in real money, so unless you’re betting 100 coins at $0.01 or $1, you will have to do some math in your head. You can manually stop the reels with the skill stop feature by hitting the “Stop” button during a spin. To play the Grail Maiden video slot while betting 100 coins per spin, hit the “Max Bet” button. For all other wagers on Grail Maiden, press the “Spin” button. The highest paying symbol on the Grail Maiden video slot is the Maiden symbol. On a 25-credit bet, the Grail Maiden symbol will pay out 1000 credits. On a maximum 100-credit bet, the Maiden symbol will pay out the 4000 coin top jackpot. The Knight and Horse symbols will pay out 3000 coins each on a maximum bet. Grail Maiden’s wild symbol is the Holy Grail symbol. It will substitute for all symbols except for the scatter symbol. The Grail Maiden symbol does not pay out by itself. It only appears on reels 2, 3 and 4. The Grail Maiden logo is the scatter symbol on the Grail Maiden slot game. 3, 4 or 5 scatter symbols will pay out 2X, 10X or 50X your total bet. When the Knight symbol appears on the first reel, the Holy Grail on reels 2, 3 and/or 4 and the Maiden on reel 5 will trigger the Grail Maiden free spins feature. It will also trigger if the Maiden appears on reel 1 and the Knight on reel 5 (with the Grail symbol anywhere in the middle). You will win 5 free spins. Every Grail symbol you trigger will become an expanding wild. Expanded Grail reels are held during the free spins feature. The free spin feature can be re-triggered on non-held reels. New triggering Grails are expanded and held for the remaining free spins. Wagers during the free spins feature are the same as the spin that triggered the free spins feature. Hit “Autoplay” to open up the Grail Maiden autoplay mode where you can select the number of spins (5, 10, 25, 50, 100, 250 or 500) and number of seconds between spins (0.25, 0.50, 1, 1.5 and 2). Stop settings are stop once all spins are complete, stop when jackpot is won, stop if a win exceeds or equals ($50, $100, $150, $200 or $250), stop on any win and stop if credits increase/decrease by ($50, $100, $150, $200 or $250). You can cancel autoplay on the Grail Maiden video slot at any time. At the time of this writing, Grail Maiden is the only 243-way video slot available at Vegas Tech. The payouts are listed at 25 coins, which can be confusing. It doesn’t help that the bets aren’t listed anywhere in cash. It’s not the best looking slot, but for many players located in the United States, it’s the only option for a 243-way slot. You can play Grail Maiden and get a $20,000 signup bonus in addition to 4 free slot tournament tickets when you sign up and deposit at Go Casino! Are USA players able to play the Grail Maiden video slot for real money? At this time, Grail Maiden is the only 243-way video slot available for American players to play for real money. Players from the United States of America are welcome to play the Grail Maiden 243-way slot at Go Casino and VIP Slots Casino. Is there a Grail Maiden Flash game available anywhere? Unfortunately, Grail Maiden is not only of the slot games available at Go Flash Casino and VIP Slots Flash Casino. With that said, there are many other slots available for you to play at those Instant Play casinos. A 243-way video slot is a video slot that pays in ways rather than paylines. What it means is that if you have a matching symbol on the top position of reel 1, bottom position of reel 2 and middle position of reel 3, it will still count as a winning combination rather than the symbols having to be in a specific pattern. This opens up more chances for the player to win. For more 243-way video slots, please read our Lord of the Rings Video Slot Review, Ghost Pirates Video Slot Review, Archer Video Slot Review, Alaskan Fishing Video Slot Review and Thunderstruck II Video Slot Review.